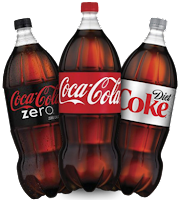 FREE Coke 2-liter for Shop'nSave & Lowes Shoppers! Wow, head over to Aisle50 to score a free Coke 2-liter bottle! This offer is valid at Shop'nSave and Lowes foods stores. Deal is for any 2-liter Coca-Cola product included in this list: Coca-Cola, Diet Coke, Coca-Cola Zero, Cherry Coke, Diet Cherry Coke, Cherry Coke Zero, caffeine-free Coca-Cola, caffeine-free Diet Coke. No purchase necessary. All you need to do is enter your email address, zipcode, and loyalty card number. Then pick it up for free at your local grocery store. That’s it!